New! Introductory Special Ends Soon! This new Ping Pong Diplomacy T-Shirt from Paddle Palace celebrates the role our sport of table tennis in Ping Pong Diplomacy! Blue shirt is screenprinted on the front with a special custom design. Next Level brand t-shirt is soft and comfortable, made of 60/40 cotton/polyester blend. In 1971, the US Table Tennis Team received a surprise invitation to travel to China. The 15-member US delegation (7 players plus officials) helped to open relations with China with this visit that created a media sensation around the world. 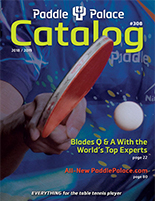 Paddle Palace owner Judy (Bochenski) Hoarfrost was the youngest (15-year-old) player on Ping Pong Diplomacy team.